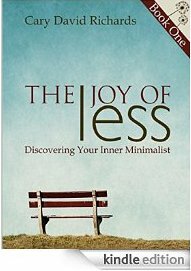 Simplify your life and discover the Joys that come from minimalist living. What if you could live on purpose and reduce or eliminate most of the stress and worry that you experience on a daily basis? Overwhelmed and exhausted, we tend to hit the ground running every morning without much thought to what exactly we are doing or why we’re doing it. Phone calls, texts, e-mails, Kids sports and yoga classes. It’s all a blur of activity and deadlines. Are these activities meaningful to you? Are they contributing to your joy and serenity or is the mindless rushing about simply a way of not thinking about what’s really important? ˃˃˃ The ability to simplify life is the ability to declutter your soul and live with emotional simplicity. Simple organized living is a wonderful concept but it takes more than throwing a bunch of unwanted stuff in a box and making a dump run. It requires a paradigm shift and a commitment to doing things in a different way. An attitude shift towards the things you have and the things you want. Before you simplify your space, you need to be able to be emotionally and spiritually ready to not only handle the decluttering projects you are going to tackle but to permanently change your habits and attitudes towards your material possessions as well as your relationships. In it, Cary David Richards details how he and his wife Jeannie were forced by circumstances to downsize and simplify. How over time they came to understand that minimalism has some very tangible and important long term benefits. From reduced stress to being able to think with clarity and vision, Cary and Jeannie’s minimalist journey will illuminate the joy and explain the challenges of a life lived with Less and an existence filled with freedom and happiness. Let Cary David explain how to painlessly and effectively de-clutter you from the inside out and prepare you for the minimalist path. A minimalist cheat sheet for simple organized living. How to get off the stress, complexity and overwhelm merry-go-round and simplify your life. The second book in Cary David Richard’s two book series on minimalist living details how to simplify your space and gives you down to earth real world strategies for declutering your home. After being forced by circumstances to downsize and simplify Cary David and his wife Jeannie came to realize that their new minimalist life style had some very tangible and far reaching benefits. They began to re-think their previous lives of consumerism and the habit of accumulating more and more “stuff”. ˃˃˃ The ability to simplify life is the ability to declutter your soul, be present and in the moment and live with emotinal clarity. Through the conscious implementation of minimalist living concepts, the couple realized that living with less brought a freedom and serenity not available in their previous lives. Never setting out to become minimalist, they embarked on a journey of simplicity and discovered what was most important to them in the process. 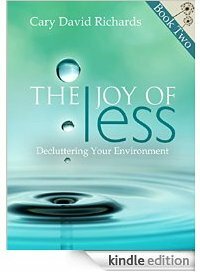 Through the lessons that Cary David and Jeannie learned over the last seven years of exploring minimalism you will come away with a new understanding of the benefits of decluttering your life. Once free of the burden of clutter and complexity new vistas will open to you. Just imagine being able to breathe again, living in a serene, nurturing, welcoming environment, free of stress and worry.